You may drain multiple domains to pay for The Foundation. 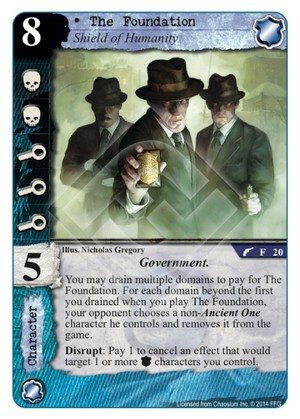 For each domain beyond the first you drained when you play The Foundation, your opponent chooses a non-Ancient One character he controls and removes it from the game. 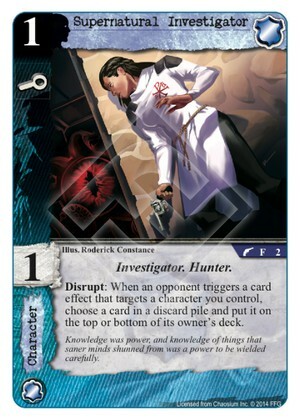 Disrupt: Pay 1 to cancel an effect that would target 1 or more [Agency] characters you control. While attached character is committed to a story, it counts its icons at each other story where you have 1 or more characters committed. 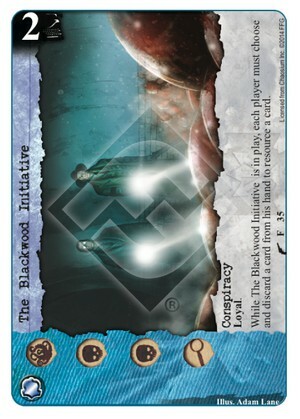 While The Blackwood Initiative is in play, each player must choose and discard a card from his hand to resource a card. 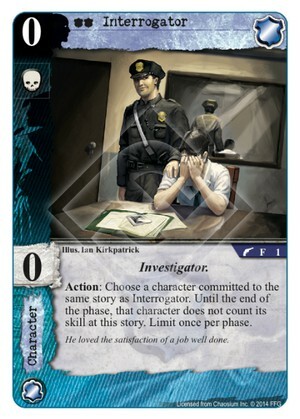 Action: Choose a character committed to the same story as Interrogator. Until the end of the phase, that character does not count its skill at this story. Limit once per phase. He loved the satisfaction of a job well done. 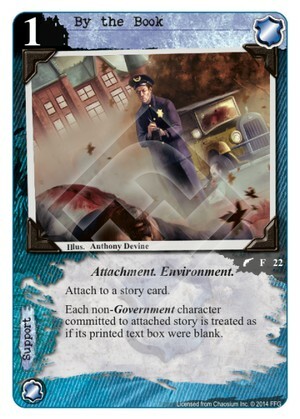 Disrupt: When an opponent triggers a card effect that targets a character you control, choose a card in a discard pile and put it on the top or bottom of its owner’s deck. Knowledge was power, and knowledge of things that saner minds shunned from was a power to be wielded carefully. 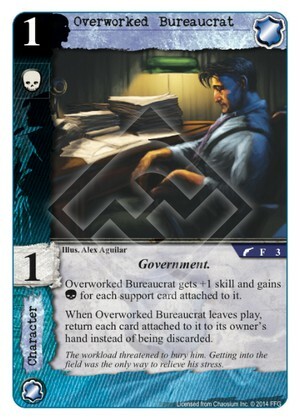 Overworked Bureaucrat gains +1 skill and gains (C) for each support card attached to it. When Overworked Bureacrat leaves play, return each card attached to it to its owner’s hand instead of being discarded. Immune to opponent’s triggered effects. Even the most bizarre cases left him unphased. Only one woman knew why even the most graphic gangland slaying couldn’t touch him. When you would uncommit Relentless Stalker from a story, you may choose to not uncommit it until the story is won. 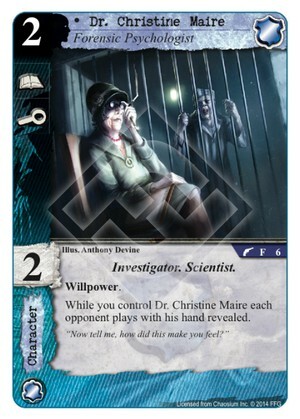 While you control Dr. Christine Marie each opponent plays with their hand revealed. 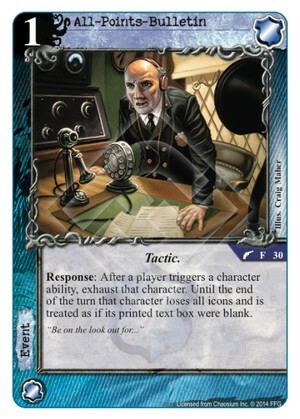 Response: After you succeed at a conspiracy where Intelligence Agent is committed, shuffle that conspiracy back into it’s owner’s deck. 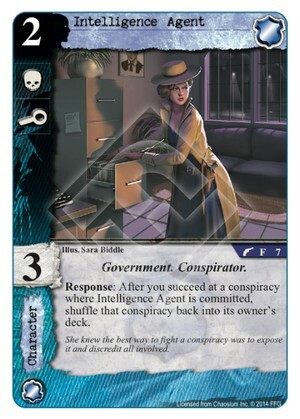 She knew the best way to fight a conspiracy was to expose it and discredit all involved. 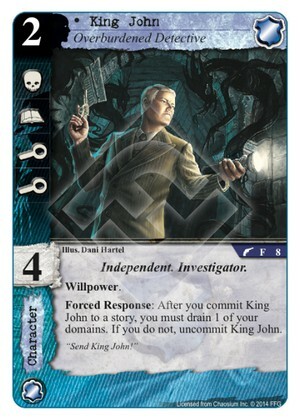 Forced Response: After you commit King John to a story, you must drain 1 of your domains. If you do not, uncommit King John. 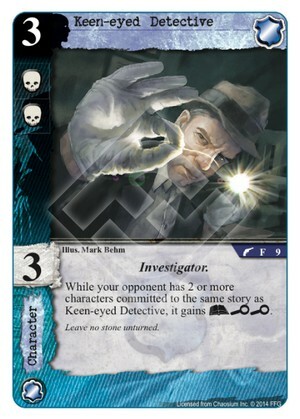 While your opponent has 2 or more characters committed to the same story as Keen-eyed Detective, he gains (A)(I)(I). 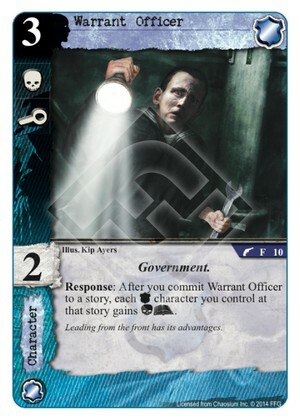 Response: After you commit Warrant Officer to a story, each [Agency] character you control at that story gains (C)(A). Leading from the front has its advantages. 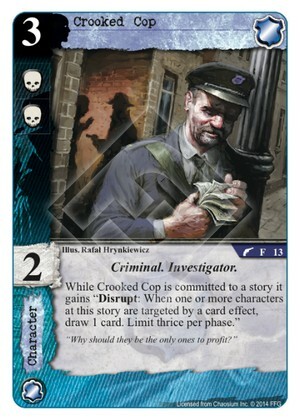 Action: Pay 1 to choose an opponent’s character committed to a story. 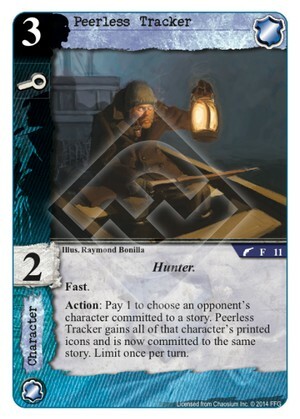 Peerless Tracker gains all of that character’s printed icons and is now committed to the same story. Limit once per turn. Non-Loyal characters do not count their struggle icons or skill at the same story Grete Wagner is committed to. 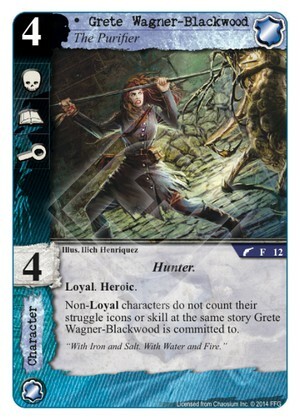 Response: After you play a Hunter character, your opponent must choose and wound a character with a (T) icon, if able. 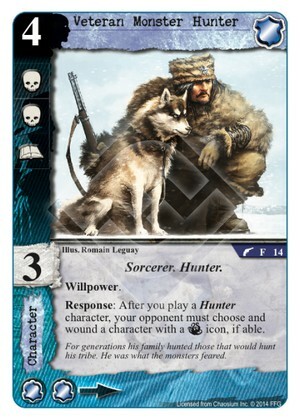 For generations his family hunted those that would hunt his tribe. He was what the monsters feared. 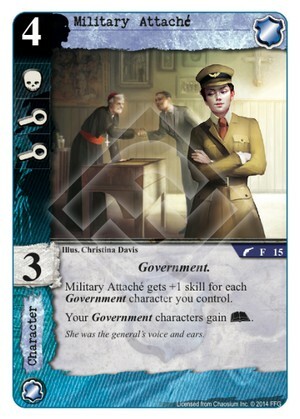 She was the general’s voice and ears. 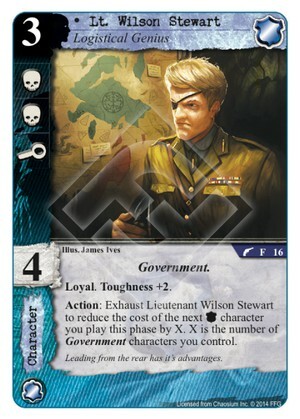 Action: Exhaust Lieutenant Wilson Stewart to reduce the cost of the next [Agency] character you play this phase by X. X is the number of Government characters you control. Leading from the rear has it’s advantages. 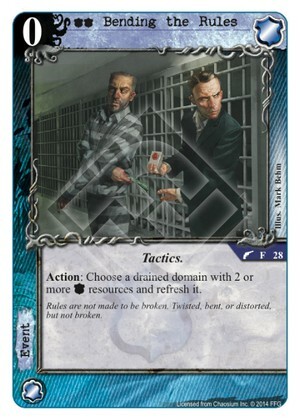 Response: After an opponent’s character is destroyed by the results of a (C) struggle, choose a character card attached to a domain and discard it. 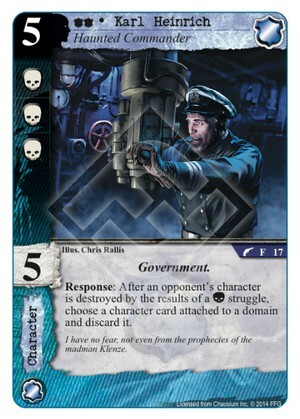 I have no fear, not even from the prophecies of the madman Klenze. 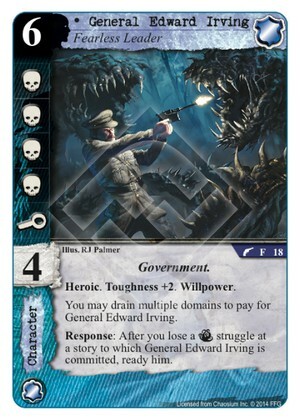 You may drain multiple domains to pay for General Edward Irving. Response: After you lose a (T) struggle at a story where General Edward Irving is committed, ready him. 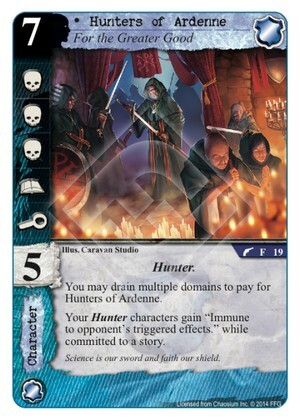 You may drain multiple domains to pay for Hunters of Ardenne. 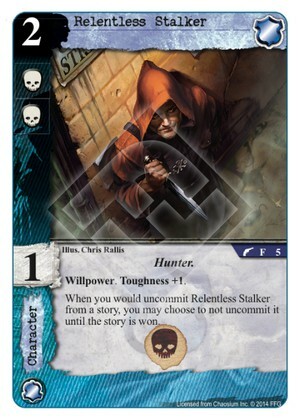 Your Hunter characters gain “Immune to opponent’s triggered card effects” while committed to a story. Science is our sword and faith our shield. 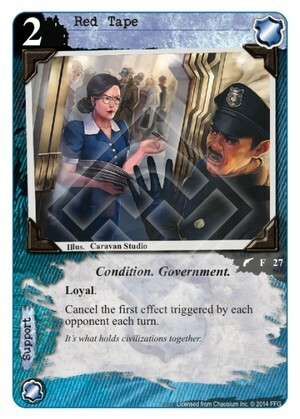 Each non-Government character committed to attached story is treated as if its text box was blank. (C) struggles resolve first at attached story. 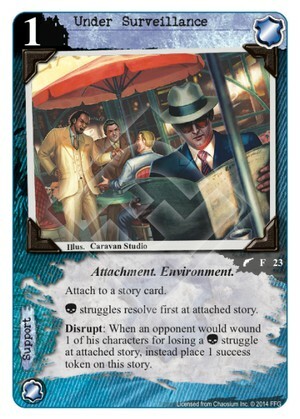 Disrupt: When an opponent would wound 1 of his characters for losing a (C) struggle at attached story, instead place 1 success token on this story. 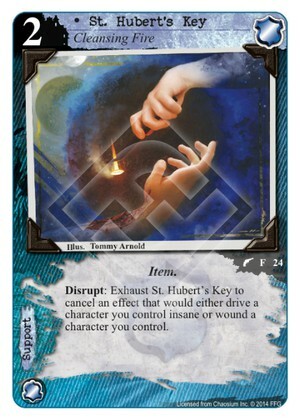 Disrupt: Exhaust St. Hubert’s Key to cancel an effect that would either drive a character you control insane or wound a character you control. 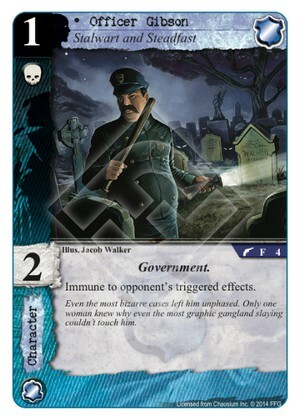 Characters you control at the same story as the attached character gain Invulnerability. 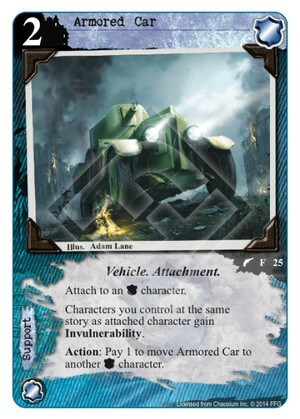 Action: Pay 1 to move Armored card to another [Agency] character. 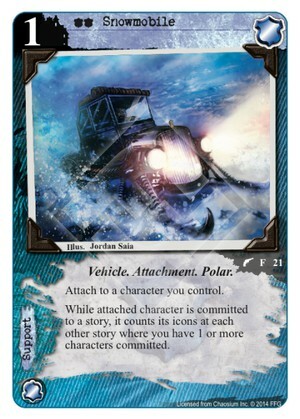 Characters you control with an attached Vehicle support card gain +1 skill and gain Fast. 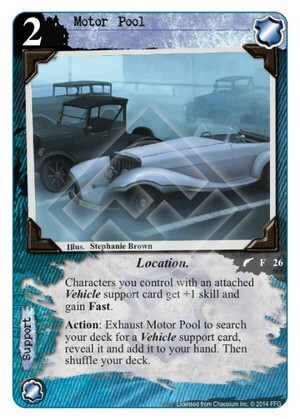 Action: Exhaust Motor Pool to search your deck for a Vehicle support card, reveal it and add it to your hand. Then shuffle your deck. Cancel the first effect triggered by each opponent each turn. It’s what holds civilizations together. Action: Choose a drained domain with 2 or more [Agency] resources and refresh it. Rules are not made to be broken. Twisted, bent, or distorted, but not broken.